Do you have a game plan for succeeding or are you just throwing your players on the field hoping they’ll figure it out? I’ll be the first to admit that sports are not my thing. I usually roll my eyes when people start throwing out sports analogies, as if I can really relate to them. But Dan Coughlin’s book, Find a Way To Win, is different. 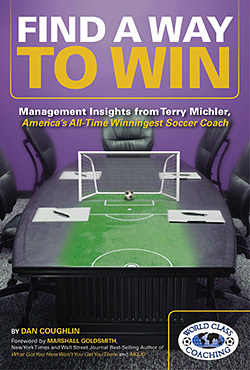 Coughlin provides us with direct access inside the head of one of America’s “all time winningest” soccer coach, Terry Michler. The book is about one man’s mission to be the best at what he does and how he succeeds big time. Coughlin’s eloquently translates Michler’s strategies into everyday plays businesses can use to create successful organizations. Here’s just one of the many examples that makes this playbook so valuable. Michler talks about selecting the very best players regardless of how old they are. He states, “You need all the right ingredients to build a championship team.” Coughlin reminds us why you must have the very best talent for your organization, regardless of the person’s age. He goes on to point out this is a starting place to eventually achieving extraordinary results as a group. I’m glad my former employer felt the same way as Michler and Coughlin when they promoted me into the role of HR Director at the age of twenty-four. I worked side-by-side with other young managers who were new to the game and I also worked with some folks who had retired on the field. Only they forgot to tell others they were no longer playing for the team. Which brings me to another point that Coughlin drills home. “Good players don’t automatically make good teams.” And I’d like to add that being a great athlete doesn’t necessarily mean a person will be competitive in the field of sales either. So as you think about assembling your own winning teams, consider taking a few plays from Coughlin’s book, which is available at worldclasscoaching.com. Be sure to come back and let me know how your team is faring both on and off the field. Charge! Sign up to receive a complimentary subscription to Roberta’s monthly newsletter, HR Matters.